In the Vallée de Joux, the historical premises of the Manufacture Jaeger-LeCoultre are now home to an exclusive space dedicated to ornamental crafts and named the Métiers Rares® (Rare Crafts) Atelier. It brings together in one place the range of skills bound up with the brand identity: enamelling, engraving, gemsetting and guilloché work. Pervaded by a combination of extreme concentration, natural sharing and boundless inspiration, this workshop devotes its multiple skills to creating remarkable models such as the Reverso Tribute Gyrotourbillon. The Rare Crafts Atelier exudes an impressive sense of closeness. Separated only by glass panels, around 30 artisans ply their trade at their wooden workbenches. All appear to be in their own private world, intently focused and oblivious to the world around them. 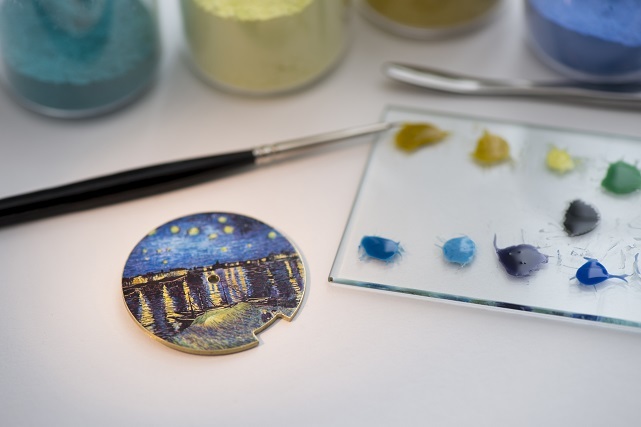 Having previously worked on separate floors according to their craft as enamellers, engravers or gemsetters, they now radiate a contagious energy stemming from their combined presence. Above and beyond the immaculate white-coated figures of the watchmakers, all eyes naturally converge on four imposing lathes that shine here in all their former glory. Duly restored and lubricated, three guilloché rose engines flaunt the complexity of their gleaming cams; while the early 20th century pantograph offers a fascinating view of its Bakelite plates depicting intricate motifs that will be reproduced to perfection on dials reflecting a fine tradition perpetuated by Jaeger-LeCoultre. The Rare Crafts Atelier pursues the purpose first embodied in the Hybris Artistica® collection through exceptional creations involving an original dialogue between the various watchmaking professions. The Jaeger-LeCoultre philosophy is distinguished by its emphasis on interaction. Above and beyond achieving mastery of every operation, those who work within the Manufacture follow an ongoing learning curve that consists in savouring the pleasure of working together. This is all the more apparent in the Rare Crafts Atelier, which is organised into competence centres. The engravers’workbenches are thus placed next to those of the chamferers, given their successive roles in the sequence of movement decoration stages. 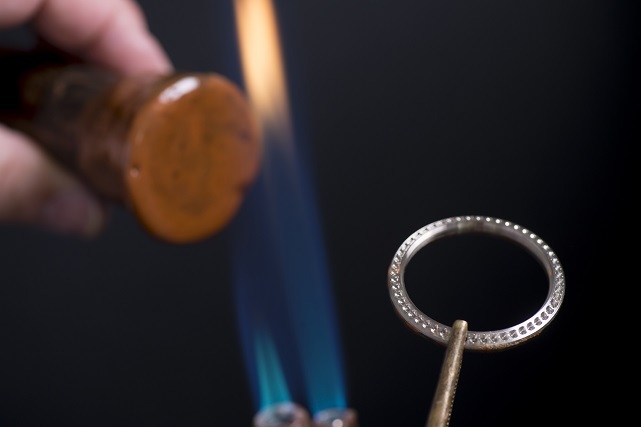 An excessively chamfered component will not leave enough space for engraving, which implies the need for exchanges between the artisans, expressed through a discerning look or a wise word that enable them to optimise their resources. The layout of the Atelier is designed to foster cooperation between the various techniques. It also aims to strengthen the ties between masters and apprentices, because transmission is an inseparable part of the rare crafts for which training courses are no longer or only rarely still available. Within the Atelier, the youngsters in training soon gain independence, just as Jaeger LeCoultre wishes, while their more seasoned counterparts are always on hand to share their experience. The result is a natural process of renewing knowledge and expertise so as to prepare for the future. Nurtured by ideas and stimulated by the lively curiosity of those exercising their talents there, the Métiers Rares® Atelier is a place where physical and intellectual interdisciplinary barriers are broken down to allow a free flow of inspiration. Where new working methods are developed and new innovations are born, leading to ever more astonishing creations. Right next to the validation centre where dials and movements are repeatedly and scrupulously examined from every possible angle, a dedicated area is reserved for tools. These have changed little over the centuries and the wide drawers are filled with short and long variously shaped handles, as well as gravers. 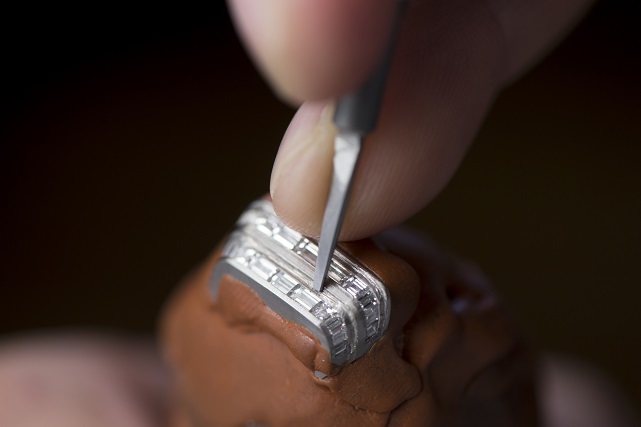 The artisans adjust the handles to fit their own hand and give the graver the appropriate cut depending on whether they are intended to engrave, set or push back the material. Each artisan works according to their specific needs: shaping, sharpening and grinding the blade on the lathe until they instinctively sense it is ready. The principle of sharing that governs the Rare Crafts Atelier naturally extends to the visitors exploring this area. Right at the centre, Jaeger-LeCoultre has chosen to place an elegant yet imposing made-to-measure wooden table echoing the nearby workbenches. It is the key element in a scenography that creates an immersive and inevitably memorable experience. Discreetly positioned above the table is a projector linked up with cameras fixed to the various workstations. With the permission of the artisan who agrees to be being filmed, the table gives a whole new meaning to the term “flat screen”by providing live streaming of the work in progress, magnified 40 times. Each sliver of brass removed and each pigment applied become actors in a live show that is at last revealed. Meanwhile, the glass panels provide an opportunity for real-scale observation of the artisans at work and thereby to gain a keen awareness of their incredibly accurate, delicate gestures. Visitors will never look at Jaeger-LeCoultre movements and dials in the same way again. Guilloché work takes on a new dimension at Jaeger-LeCoultre, alongside the historical disciplines cultivated within the Maison. This technique is performed in circular or linear fashion, by moving the part to be decorated across a sharp-edged tool that remains immobile. 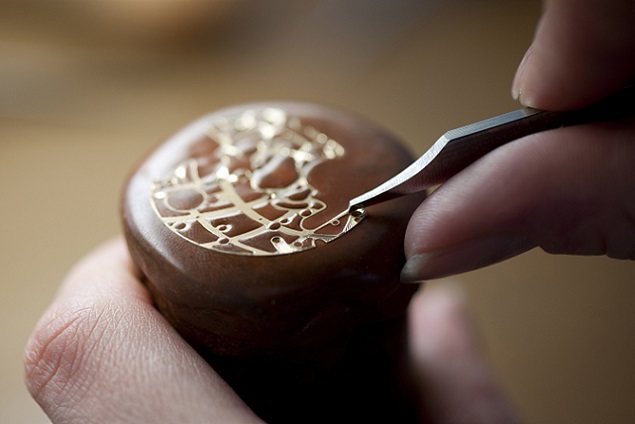 Under the firm pressure of the artisan’s thumb, the metal shavings are successively removed to reveal a shiny motif. The contrast between the bulky, almost rustic-looking rose engine and the elegantly intersecting straight lines and curves is visually striking. The art of guilloché work lies in understanding the corresponding“machine” which is more like a hand tool, in truly loving it so as to compose the flowing and inspired sequence of moves that will give the cut metal its inimitable gleam. Above and beyond mere ornamentation, the resulting dials are endowed with a unique shimmer that only the human hand can create. While personalising the back of the watch is an essential part of the Reverso philosophy, other Jaeger-LeCoultre watches lend themselves just as ideally to the intensely pure skills of line, gemset, lacquered or modelled engraving. An engraving may take around two hours if it involves just initials, or stretch over an entire week when it comes to reproducing a face or a coat-of-arms that must be redrawn by hand. Engravers also display the full extent of their talent when skeletonworking extremely small series of movements. They base their work on the movement plans, carefully seeking the design that will enable him to preserve all the parts required for its smooth operation. 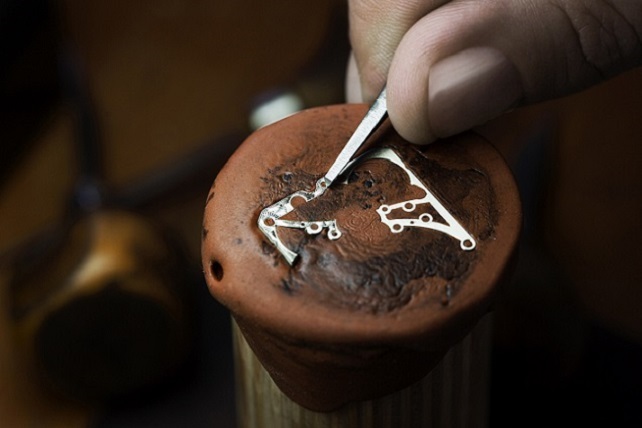 Using a tiny hacksaw, the skeleton-work specialists recreate the previously drawn motif on the component in question. 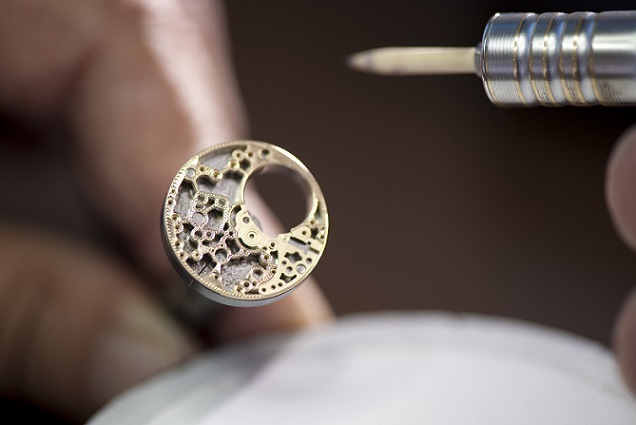 Three weeks of intense concentration are required to skeletonwork the Jaeger-LeCoultre 101 calibre, a process that entails removing 0.2 grams of material from a total 0.98 grams. Enamel is the triumph of colour over time. 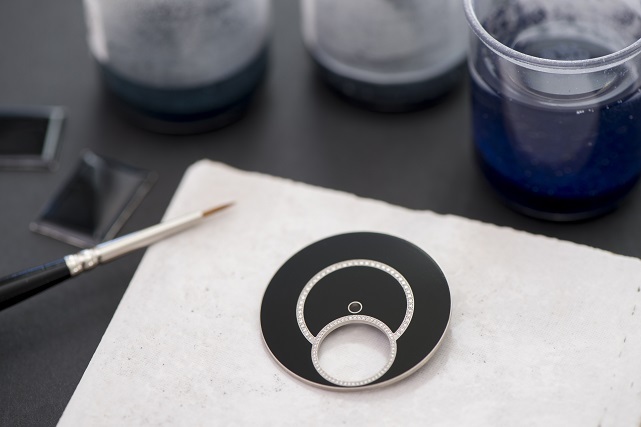 Jaeger-LeCoultre has opted for the noble and particularly delicate technique known as Grand Feu enamelling. The artisans work with a gold case featuring a 0.4 mm recess coated with three layers of white enamel. The motif is then designed using enamel fragments coloured by metal oxides that are crushed to powder and mixed with oil. 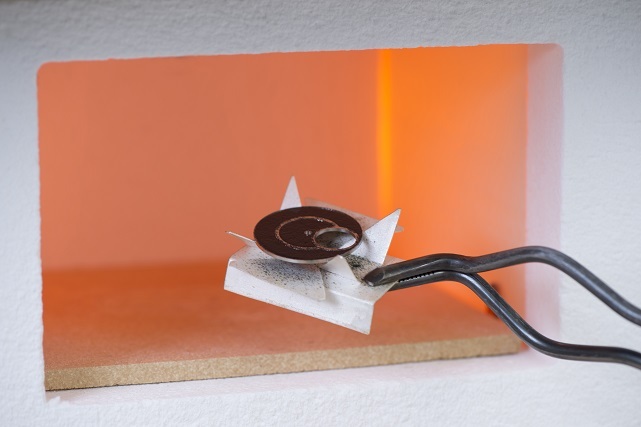 Firing in a kiln heated to 800°C solidifies the matter on its base. This Grand Feu enamelling technique endows the models thus adorned with exceptional purity and longevity. 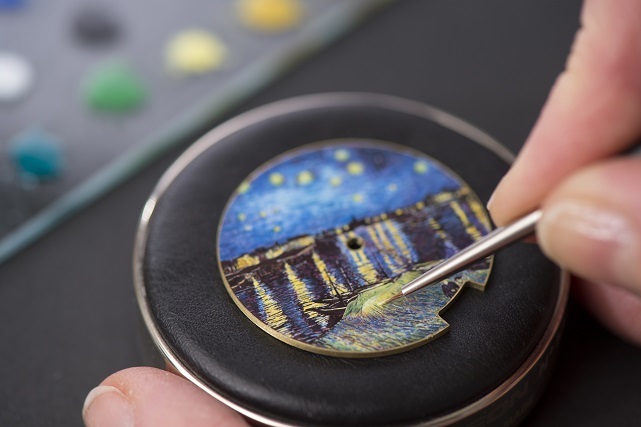 Six to ten layers of transparent protective enamel are then applied to the dial that is carefully sanded and polished to achieve a shiny, finely glazed appearance. Each piece is fired between 17 and 22 times during the vitrification process, and each time, the enamel could crack and ruin hours of work. 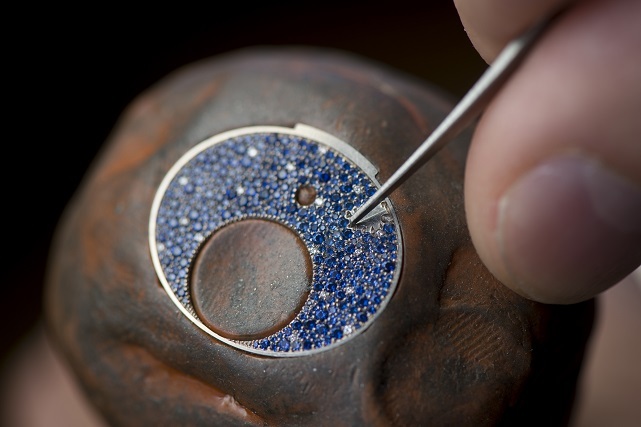 Despite the risks, the enamellers in the Atelier never tire of experimenting. Be it through enamel with guilloché motifs or enamel miniature painting: they deliberately play with fire to recapture techniques or develop new ones. 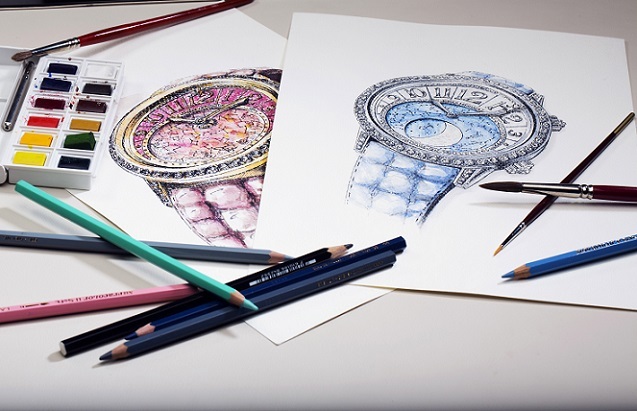 Whether on Haute Joaillerie creations or classic models, gemsetting as Jaeger-LeCoultre sees it is not about an overabundance of precious stones, but instead about stirring emotions and a sense of wonder. Once the gems have been selected, artisans begin the preparatory “milling and drilling” work known by the French term mitraillage. They create the seats that will house the stones and carefully draw out the beads that will serve to secure them. Several techniques are available, including traditional bead setting done using stones of similar size held by four beads, along with baguette (tapered) or bezel setting. 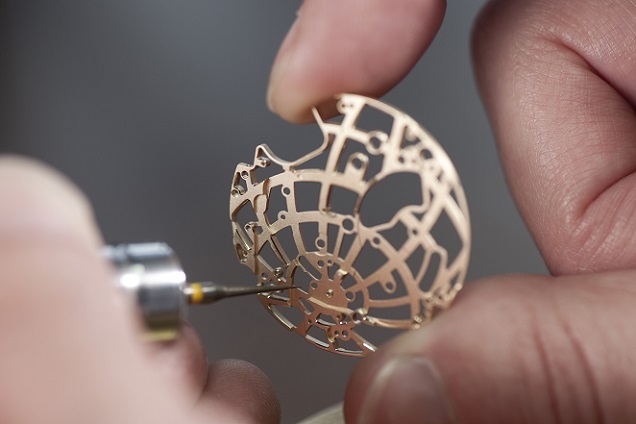 Jaeger-LeCoultre has innovated by transposing an exclusive jewellery technique to watchmaking, known as gemsetting, in which the artisan directly creates the pattern in step with his thoughts and inspiration, based on diamonds of varying diameters. They nestle against each other so as to entirely cover the gold surface, ensuring that the smooth feel of the surface is undisturbed by any prongs or sharp edges. The breathtakingly random nature of snow setting means that when the gemsetting begins, nobody can predict which gem will spring to life. Another signature technique used by the Maison is invisible or mystery setting, in which the stones are juxtaposed without the tiniest gap that might lessen the beauty of the craftsmanship. Eleven gemsetters, seven enamellers, five engravers, a guilloché specialist, three artisans dedicated to chamfering and to driving-in operations, as well as a polisher, daily exert their skills in the Rare Crafts Atelier. Wide bay windows extend an invitation to admire the beauty of the Jura spread out before them, while allowing the light to stream in freely. The philosopher Jean- Christopher Bailly describes light as an infinite workshop, because it sets human beings to work, nurturing their curiosity and driving them to excel. Nothing could be more true within this sanctuary of exceptional skills, where ancient crafts are expressed in a contemporary manner so as to deliver a perpetually renewed message of beauty.